Join downtown Phoenix business, community, and city leaders for a special holiday edition of RadiatePHX, held on stage of the historic Orpheum Theatre. This month’s RadiatePHX features brief updates on downtown initiatives and some festive performing arts moments to help “city-brate” what makes downtown Phoenix special. Performing arts entertainment includes Dickens Carolers, Arizona School for the Arts Student Jazz Ensemble and The Nash Jazz Ensemble. Guest speakers include Phoenix District 7 City Councilman Michael Nowakowski; John Chan, Director of Phoenix Convention Center & Venues; and Downtown Phoenix, Inc. President & CEO, David Krietor. When: Tuesday, December 16, 5 p.m. to 8 p.m.
Where: Orpheum Theatre, 203 W. Adams St. Downtown Phoenix, Inc. is a unique partnership of business, community and city leaders charged with coordinating and advancing the revitalization of Downtown Phoenix. DPI coordinates the activities of the Downtown Phoenix Partnership and Phoenix Community Alliance while assuring that the Downtown business community has a synergistic relationship with its community partners and surrounding neighborhoods. Visit downtownphoenix.com. Downtown Phoenix Journal invites you to Explore Your Core, offering a friendly, straightforward insider’s view of all things Downtown Phoenix. DPJ is powered by Urban Affair LLC, which was founded to elevate urban ideas, ideals and Phoenix’s sense of place by articulating and promoting the voices and insights of the community. This focus contributes to the development of a dynamic core sensibility in the predominantly suburban Valley of the Sun. Visit downtownphoenixjournal.com. Phoenix Community Alliance is an affiliate of Downtown Phoenix, Inc. and the premier membership organization for downtown leaders. Through the alliance of a strong and diverse membership, PCA fulfills its mission to activate, advocate and build the Phoenix we want. Visit phoenixcommunityalliance.com. 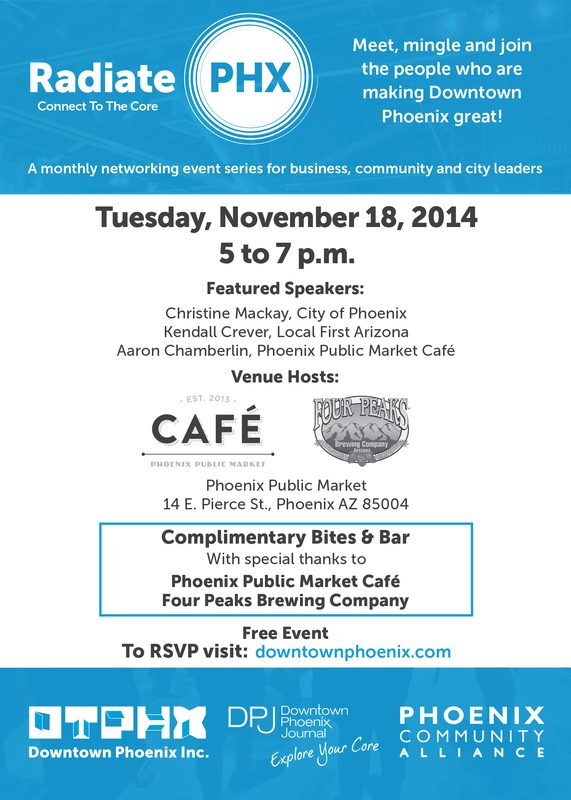 Join downtown Phoenix business, community, and city leaders for RadiatePHX, a free networking event series held on the third Tuesday of each month. Presented by Downtown Phoenix, Inc., Downtown Phoenix Journal, and Phoenix Community Alliance, RadiatePHX provides a forum to learn about downtown opportunities, issues and solutions; receive key updates from guest speakers on what’s happening in downtown; and discover how you can contribute to building the downtown we want. This month’s RadiatePHX will be hosted outside at the Phoenix Public Market Cafe and feature brief updates on local downtown initiatives. Guest speakers will include Christine Mackey, Director of City of Phoenix’s Community & Economic Development Department; Kendall Crever, Community Outreach Coordinator of Local First Arizona; and venue host Aaron Chamberlin, Chef/Owner of Phoenix Public Market Café. When: Tuesday, November 18, 5 p.m. to 7 p.m.
Parking/Transportation: Valet parking provided by GoGreen Valet and bicycle parking provided by Valley Metro. Join downtown Phoenix business, community, and city leaders for RadiatePHX, a free networking event series that invites you to “connect to the core” on the third Tuesday of each month. This month’s RadiatePHX invites you to get in the game and celebrate the Phoenix Suns season tip-off. 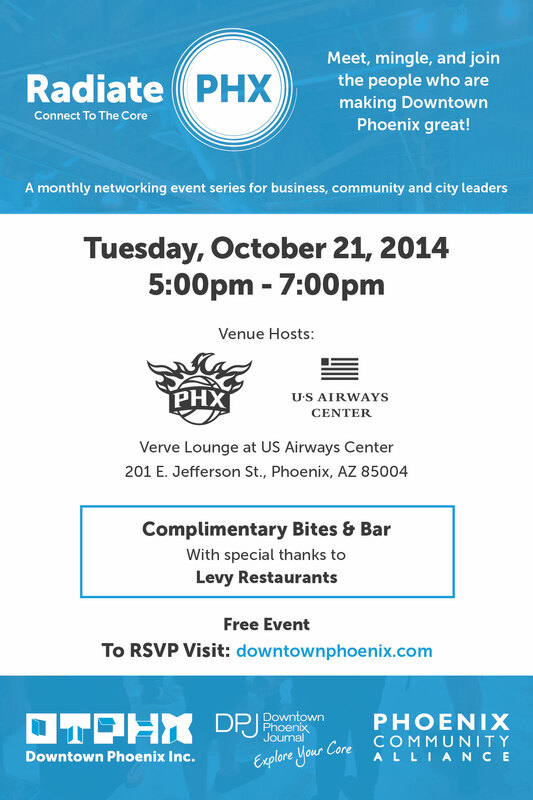 The event, hosted by the Phoenix Suns in the Verve Lounge at US Airways Center, will feature brief updates on sports and fitness initiatives in downtown. Guest speakers will include Phoenix District 5 City Councilman Daniel Valenzuela; Jason Rowley, Suns President; and Ralph Marchetta, Senior Vice President, Ticket Operations & General Manager of Sports & Entertainment Services for US Airways Center. When: Tuesday, October 21, 5 p.m. to 7 p.m.
Join downtown Phoenix business, community, and city leaders for RadiatePHX, a free monthly networking series that connects you to the people, projects, issues, and solutions that are building the downtown we want. Hosted by Downtown Phoenix, Inc. and Downtown Phoenix Journal, RadiatePHX provides an opportunity to connect with a broad spectrum of downtown advocates, receive key updates from guest speakers on what’s happening in the city core, and learn how you can connect and contribute. On tap for September are a welcome from this month’s site host, Dr. Steven Tepper, Dean of the ASU Herberger Institute, and remarks from City of Phoenix Councilwoman Kate Gallego. The arts will be spotlighted as a vital element to a vibrant downtown – from theater productions and gallery openings, to concerts and festivals. The arts bring our community to life. RadiatePHX attendees will find out what’s in store for the 2014/2015 arts season, and together we’ll brainstorm a “Top Things to Do in Phoenix” list to showcase our city to NFL Pro Bowl and Super Bowl media, and beyond. When: Tuesday, September 16, 5 to 7 p.m.; program begins at 6 p.m.
Info: For more information visit our Facebook page. Click to RSVP. Each month, RadiatePHX will invite you to “connect to the core” at a friendly, informative, networking event that will keep you in the know about downtown. Save the Date to RadiatePHX! Downtown Phoenix Inc. and Downtown Phoenix Journal are bringing the return of a monthly non-traditional networking event that spotlights and celebrates our downtown. You are cordially invited to Connect to the Core and together we’ll radiate the activity and energy of this dynamic community. RadiatePHX: Nov 29 | DPJ Anniversary Party! You’re invited to a Radiant evening! This month’s RadiatePHX happy hour is a celebration of DPJ Mag’s Anniversary! Parking is available on the street (meters) and in nearby lots ($5). It’s an easy walk from from Central & Van Buren Light Rail Station and a bike rack is available. We like to stay on top of the topical issues of the day, and this month there is nothing more topical than the Phoenix mayor runoff election on November 8. So, why stage a separate event when we have a Mayoral debate right here in our backyard, with a theme that hits close to home? ASU’s Global Institute of Sustainability is sponsoring the debate next Tuesday, October 25, in partnership with the Green Chamber of Greater Phoenix, and is extending a special invitation to RadiatePHX fans and the Downtown community to attend. This is an important election for Downtown Phoenix. Even if you already know who you’re voting for, come hear the candidates’ stance on our sustainable community. 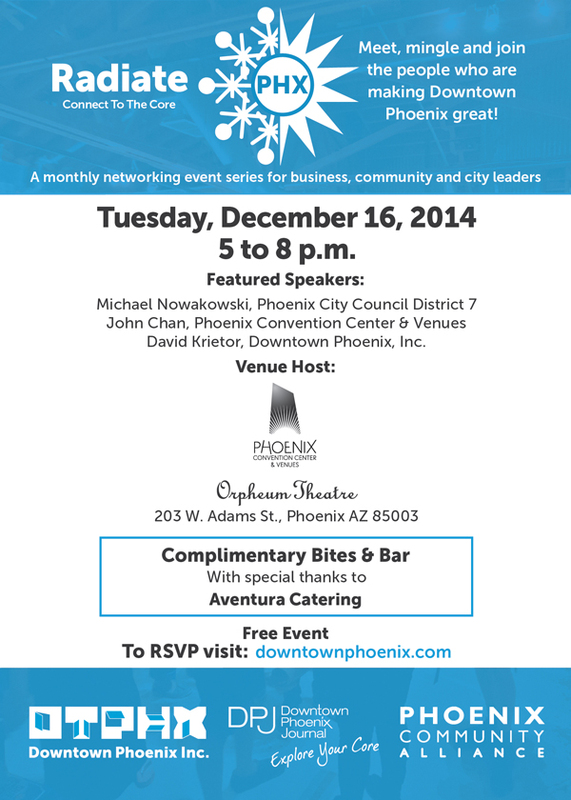 Go to Downtown Phoenix Journal for details, or make the decision now and RSVP. Save the Date: this month we’re celebrating the fourth anniversary of RadiatePHX! Join us as we toast the people, places and happenings of Greater Downtown Phoenix at an iconic Downtown space: monOrchid. RadiatePHX is back from Summer break and we’re toasting the toasty (tropical?) temps at The Rum Bar at The Breadfruit! You won’t want to miss a special appearance by Mark Dudlik. Now is the time to learn all about the upcoming Phoenix Design Week(s), including Phoenix’s role as host of the national AIGA Conference. Mark is the just the person to share how we all can support these great events. Address: 108 East Pierce St. Many thanks to owners Dwayne Allen and Danielle Leoni for their hospitality! Yep, 1st Street is under construction, so approach parking from 2nd Street. It’s also an easy walk from from Central & Roosevelt Light Rail Station. We’re popping up this month in a place that promises to be short-lived: Cycle! Come meet the minds behind this eclectic watering hole, and find out more about the world-class destination that will emerge from this temporary cocoon. Easy access from Light Rail, Central & Roosevelt Station, and free parking behind the hotel.